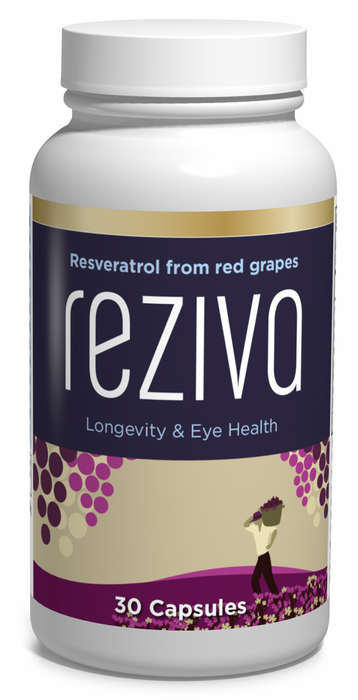 Reziva® is a concentrated extract made from red wine grapes grown in the fertile valleys of southern France. The name lovingly comes from "Ziva," the Slavic Goddess of Longevity. 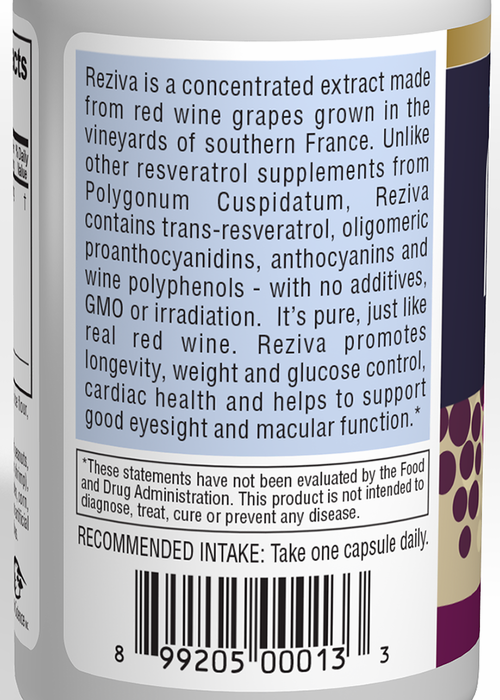 Unlike other resveratrol supplements made using Polygonum Cuspidatum (Japanese knotweed), Reziva contains concentrated trans-resveratrol, oligomeric proanthocyanidins, anthocyanins and wine polyphenols — just like real red wine. In other words, Reziva® is concentrated red wine – but without the alcohol! 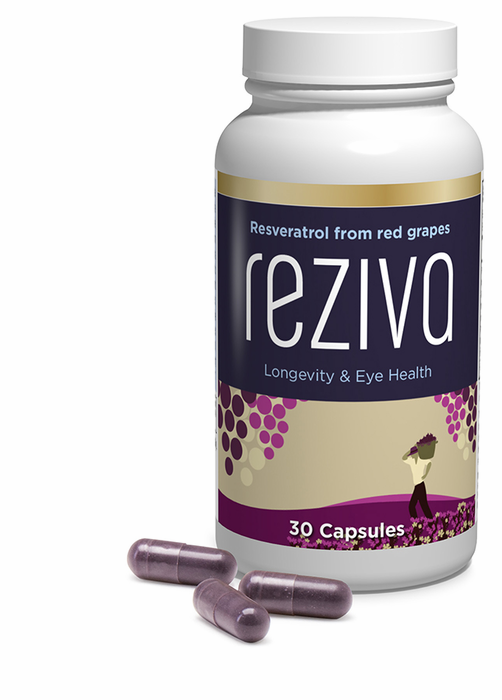 And taking only one Reziva® capsule per day gives you as much resveratrol as 30 glasses of red wine! Like all of our products, Vitamin Science independently tests every lot of every one of our supplements for potency and purity so that you are sure that you are getting the necessary nutrients. A premium resveratrol product derived from red grapes rather than Japenese Knotweed. Made with clear vegetarian capsules. I have macular Degeneration and I am taking the Gold Visivite and in the last few months I have added Reziva. I normally get a shot in my eye every 4 weeks. After the first month on Reziva along with the Visivite, my wet macular has improved and is no longer bleeding. My doctor has now moved me out to 7 weeks for the shot. I will continue to take the Reziva and highly recommend it. Every other resveratrol product I've ever found is made from Japanese Knotweed, they usually call it "Polygonum cuspidatum" so it sounds like their not selling you a weed. I did some research on Japanese Knotweed, in the UK it's considered an invasive species and you can get fined for planting it in the wild. It's also a "controlled waste" and has to be disposed of in a licensed landfill! Sounds just like the kind of thing I want to trust my heart to! Most products add a little grape seed and such so they can show pics of grapes on the bottle, don't buy into it. I have used this for years. Excellent quality and so easy to order and ship. Quick shipping. 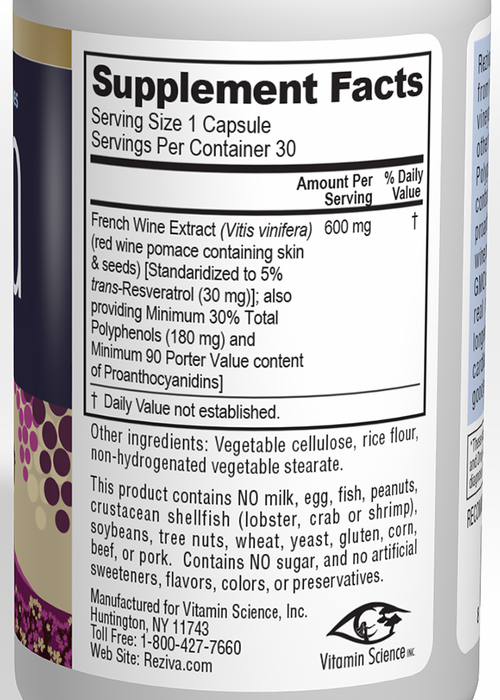 I did my research on resveratrol, and this is the best one out there. In July of last year, I was diagnosed with wet macular degeneration in the left eye. My opthamologist referred me to a retina specialist near here. When I found out what I had I went to the internet and found your site. I ordered the gold formula and started taking it. I also started taking resveratrol. I have received 4 injections of Avastin. At the last appointment he said if you continue to do so well, the next time we won't treat it just watch it. I had had an appointment with the doctor that referred me to the retina specialist. He looked in my eye and proclaimed "Its gone". I attribute my fantastic progress to Visivites and the Reziva resveratrol. Of course the medical people negate any vitamins or anything but their"medicine". Thank you for being there when I needed you!.